Judy Diem Hayes has compiled an impressive list of accomplishments in her 71 years of playing golf, but she needed 70 of them to log one of her proudest moments. 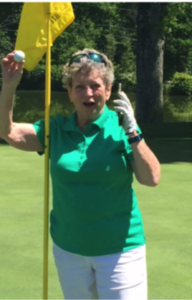 Playing the par-3, 112-yard 14th hole on May 25, 2018, at Coldstream Country Club, her home course, Hayes pulled out her 7-iron and carded the first hole-in-one of her life. Hayes’s hole-in-one caps what has been an accomplished lifetime of golf. Since she started playing as a 10-year-old at Terrace Park Country Club, Hayes has won five Metropolitan Women’s Amateur Championship tournaments, besting five different women at five different courses over a span of 18 seasons, starting in 1959 at age 22 after just graduating from the University of Cincinnati’s College of Design, Architecture, Art and Planning. Even more notable is Hayes’s dominance in her Met wins – after, that is, the first one. After losing in the finals the previous two years, Hayes cruised past 17-year-old Leslie Franz, 7 and 5, in the semifinals at Kenwood Country Club before holding off Kappa Alpha Theta sorority sister and 1956 champion Janet McIntosh to win the 36-hole championship match, 1-up. Two years later, playing out of Coldstream Country Club at Western Hills Country Club, she fought her way out of 11 sand traps and rolled to a 5 and 4 win over Franz in the finals. She didn’t win again until 1969 at Camargo Country Club, where her daughter, Tori, watched her one-putt nine of the first 12 holes on the way to a 5 and 4 win over Margaret Jones. She added a fourth trophy at Terrace Park in 1973, edging Linda Ludwig, 1-up, in the semifinals before beating former Withrow High School schoolmate Sandy Jones, 4 and 3, in the finals. Hayes never needed more than two putts that entire tournament. Hayes completed her run in 1976 at Clovernook Country Club, eliminating Jones with a 2 and 1 win in the semifinals before clinching her fifth championship with a 4 and 3 win over former Terrace Park partner Janet Craig in the championship round. Hayes, whose short game was her strength, sank a 15-foot putt from the fringe on the 12th hole to halve the hole and deny Craig any momentum. The 81-year-old Hayes, honored in 1997 as a Legend of Cincinnati Golf, spends a couple of months every year visiting her husband, Hal’s, family in Dallas and the rest of the year at their Anderson Township home, just around the corner from her long-time home course at Coldstream, where she’s won several club championships, the most recent in 2017 – a testament to her nature.